← My copies of Lottie and Dottie Sow Sunflowers have arrived!! I’m slowly getting better, which is brilliant. I have my voice back to practically full volume which is good. Not that I shout at anyone, we talk to each other in our house, which makes it all very calming. My sore throat has gone, but I’ve still got my cold, but at least that’s on it’s way out and I can now breath through my nose again. The only thing that sounds bad is the cough that I seemed to have developed. I sound awful when I cough, especially in the mornings, but hopefully that’ll go and then I’ll be back to my normal healthy self. But as I was feeling much more “normal” today I spent the afternoon in the greenhouse filming, sowing and potting on. I got loads done which was great. Firstly I filmed potting on my Nasturtiums “Jewel Mixed” into 3 inch pots. They all germinated at different times which is rather odd. I ended up with 8 plants which will be more than enough as they do tend to spread themselves about quite a lot. Then I filmed potting on my Tomaillos “Purple”, again these have been growing really well, and at various rates, but I also got 8 plants out of them. Then it was the turn of the Okra “Clemson Spineless” which again are growing really well. I’m determined to have success with these this year, but only time will tell. I potted on 8 of these as well. I’m glad it wasn’t 6 of each other above, but then it would explain a lot!! The Chives, Parsley “Giant of Italy” and Basil “Sweet” herbs I filmed when I sowed them are also doing well, and I filmed potting on the Parsley and Chives in clumps of about 6-10 plant into 3 inch pots, and the Basil in individual plants per 3 inch pots. The Basil are a little on the slow side at growing, so I only managed to prick out 1 plant, and the rest I’ll leave to grow for a little longer and then pot on. I then filmed sowing some rather interestingly named and hopefully looking Tomatoes from Pennard Plants they are: “Brandy Wine”, “Cherokee Smokey Purple”, “Black Prince”, “Emerald Green Cherry” and my favourite “Banana Leggs”. I’ll keep you updated on their progress, but they’re all different colours and sizes so should look and hopefully taste great too. 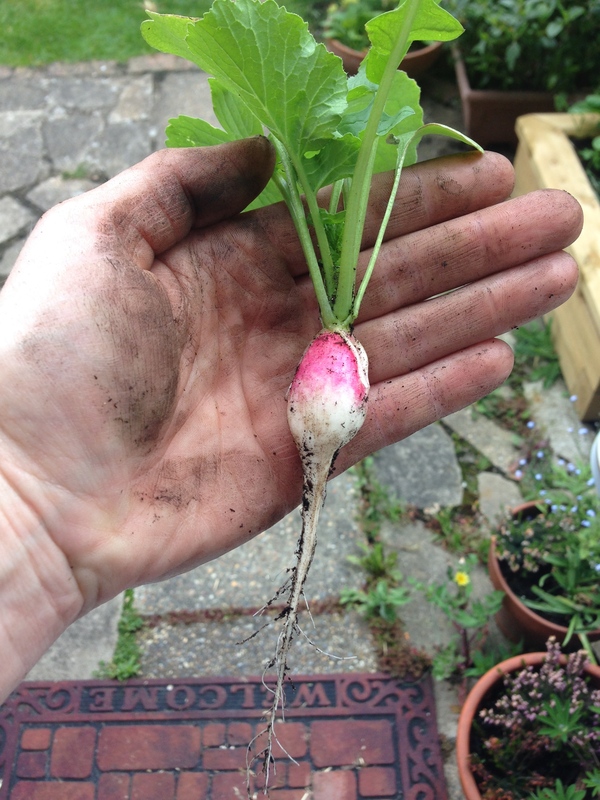 Once all that was done I was in need on a cup of tea and something to eat, so I had a look at the Radish in the Salad Bed, and one was ready!! So I carefully pulled it up, washed it and then ate it!! Oh, it was so crisp and tasty, and the heat grew on you. I was a very happy girly that afternoon, and now it’s time for a sit down and a rest. My first Radish of the year. I’m so proud. This entry was posted in Uncategorized and tagged Banana Leggs, basil, Black Prince, brandywine, cherokee Smokey purple, claire's allotment, Clemson Spineless, Emerald Green Cherry, giant of Italy, Jewel Mixed, Mr Fothergills seeds, Nasturtium, okra, Parsley, Pennard Plants, purple, sweet, Tomatillo, tomatoes, W Robinson & Sons. Bookmark the permalink.